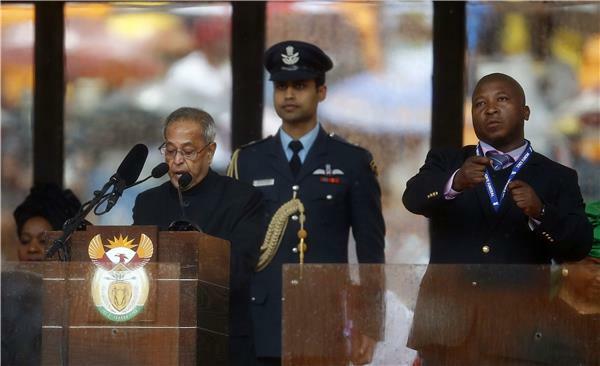 Indian President Pranab Mukherjee has just concluded brief comments at the memorial service, paying rich tribute to Nelson Mandela, and his commitment in later public to a policy of non-violence, much like the Indian independence icon Mohandas Karamchand Gandhi. 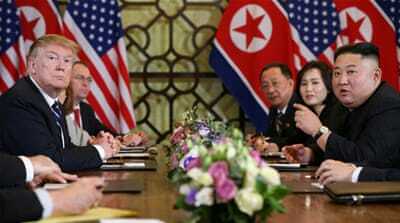 Raul Castro, the Cuban president, is up next. Watch live here on AJE. Jacob Zuma, the South African president, steps up to the podium to deliver his address. 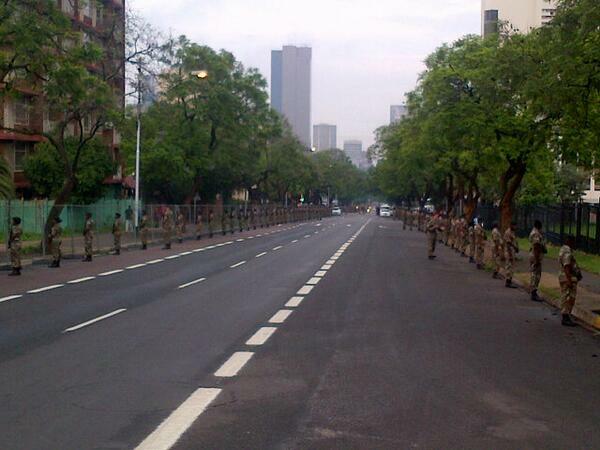 The funeral procession of Nelson Mandela has started, we will be bringing you images and quotes from the cortege throughout the day. 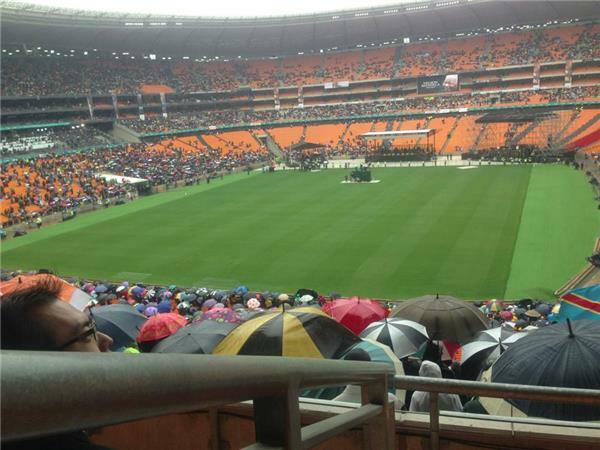 There will be further speeches today, taking place in the re-named Nelson Mandela amphitheater. 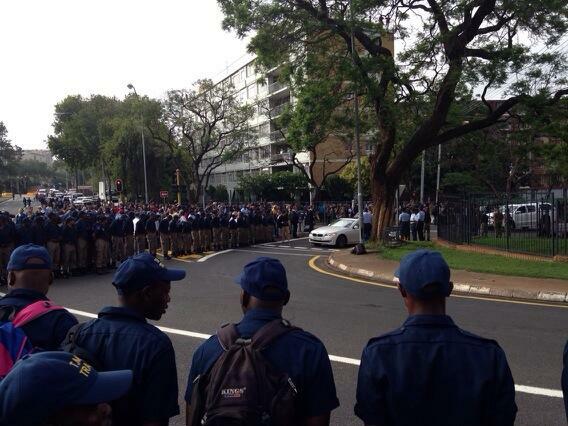 People waiting in long queues to view the body of President Nelson Mandela outside the Union Buildings in Pretoria. "They told me to bring Mandela's death certificate..."
Mike Hanna talks to the people who are braving the blazing sun to thank "Tata Mandela"
The long queues waiting to view Nelson Mandela's body are the most fitting memorial yet. Through the hours of waiting the people are dancing, singing, talking to each other and getting to know the person next to them. 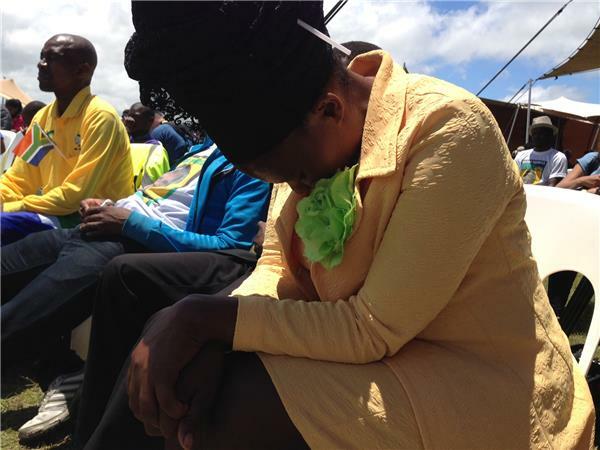 The scenes are identical to those I saw 19 years ago – when the people of South Africa waited for hours in blazing sun to vote in the country's first democratic election that brought Nelson Mandela to power. 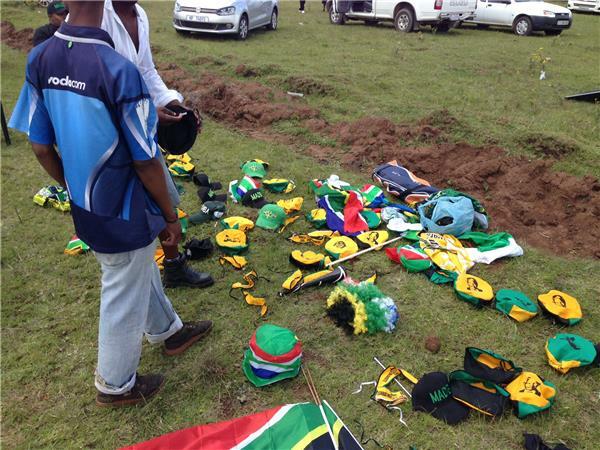 The parallel is not lost on those who are here – "we queued then for freedom " an elderly man in a newly pressed shirt with frayed collar tells me, "we queue now to thank Tata Mandela who brought freedom to us". 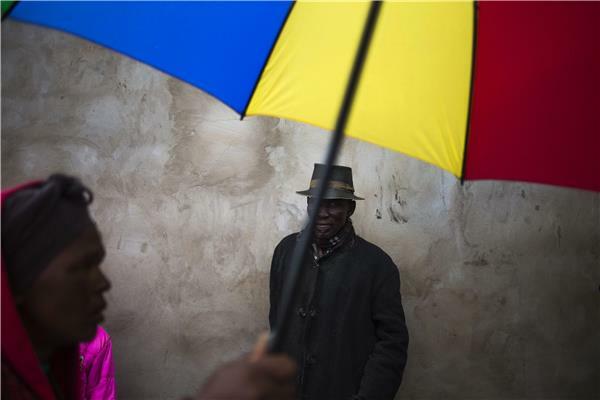 The Heads of State from around the world have had their say – South Africa's political leaders have made their eulogies. 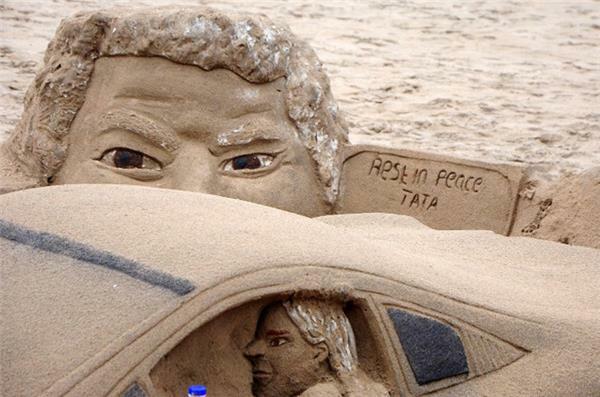 Yet nothing has moved me more than the simple words of one among the tens of thousands once again prepared to wait in the blazing sun – this time to say goodbye to Nelson Mandela, and to thank him. 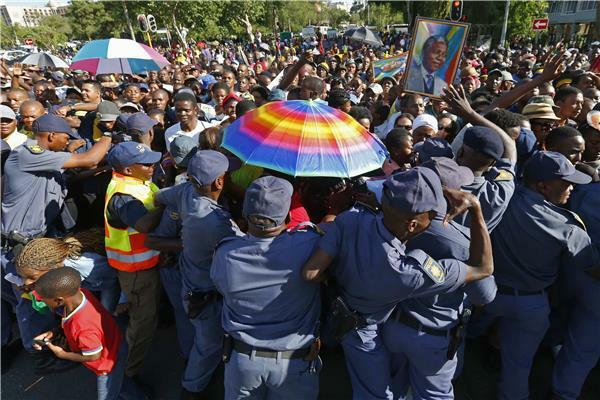 Tens of thousands of people lined the streets of Pretoria from as early as 4am, for a chance to catch a last glimpse of their hero. Dressed in colourful attire, in hats and scarves, and holding banners that paid homage to South Africa's first democratically elected president, Nelson Mandela, many waited for seven hours to catch a final glimpse of the late leader. Al Jazeera's Azad Essa captured some of the images that defined the day. To see them click here. 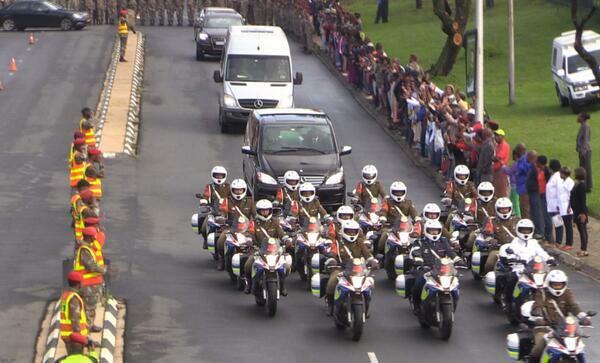 Hundreds of people have broken through a police barrier to see Mandela's body. 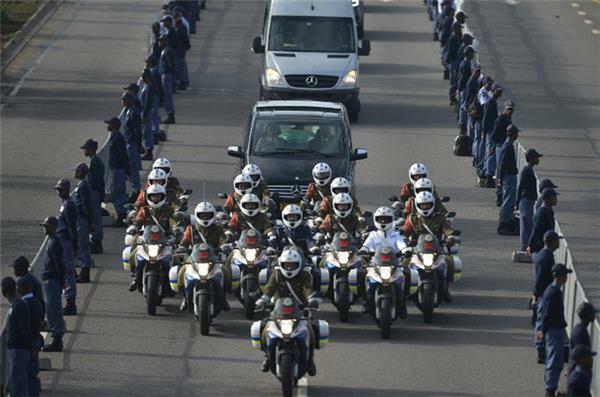 Hundreds of South Africans have pushed their way past a police cordon in a bid to see Nelson Mandela's body on the final day of his lying in state Friday, an AFP reporter witnessed. The group bustled past officers after they, along with tens of thousands of other mourners, were told they would not get to pay their last respects to their country's first black president. 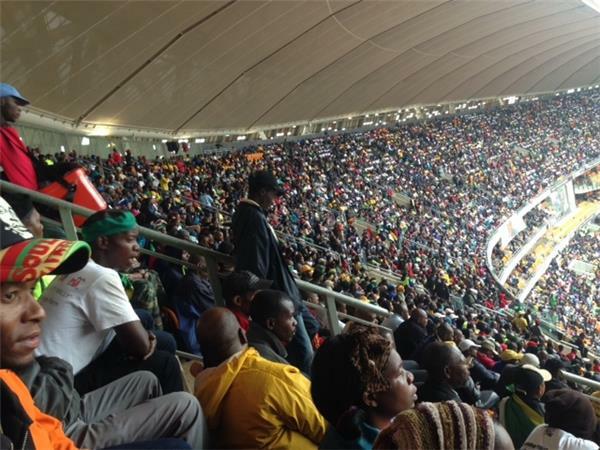 The South African government said on Friday it is aware of reports that the bogus sign language interpreter at Nelson Mandela's memorial once faced a murder charge, and said he is being investigated. 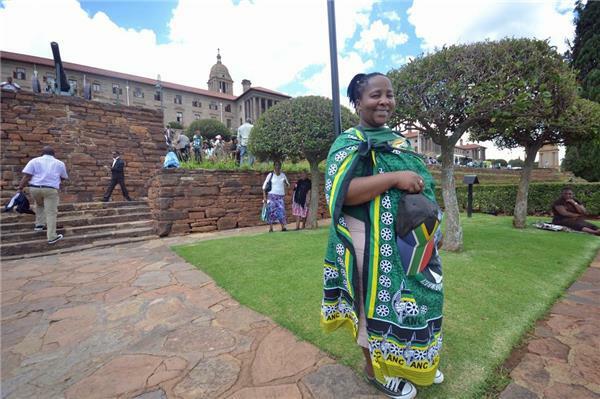 Phumla Williams of the government communications office said the government is investigating Thamsanqa Jantjie and how he was selected to interpret at a memorial on Tuesday at which he stood close to US President Barack Obama and other leaders. 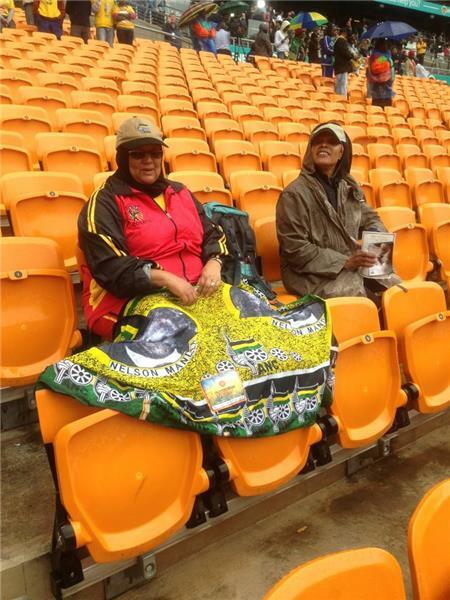 "We will come back and give a full report,'' Williams said of questions surrounding Jantjie. 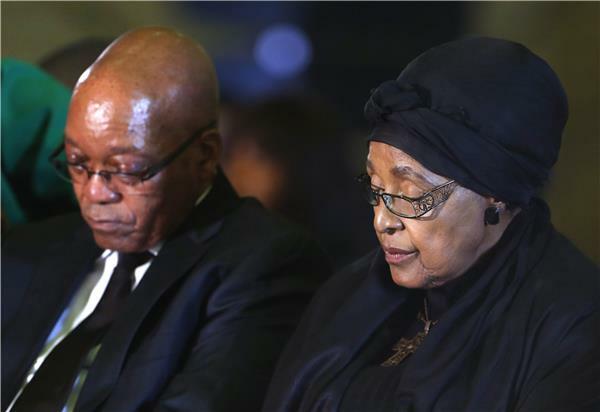 She said she and other officials are currently focusing on mourning events, which have included three days of public viewing of Mandela's casket and will end with the anti-apartheid leader's burial on Sunday. Jantjie outraged deaf people by making signs they said amounted to gibberish. A South African TV news outlet, eNCA, reported that Jantjie faced a murder charge a decade ago, but it is unclear if the case was concluded. He also reportedly faced other criminal charges. 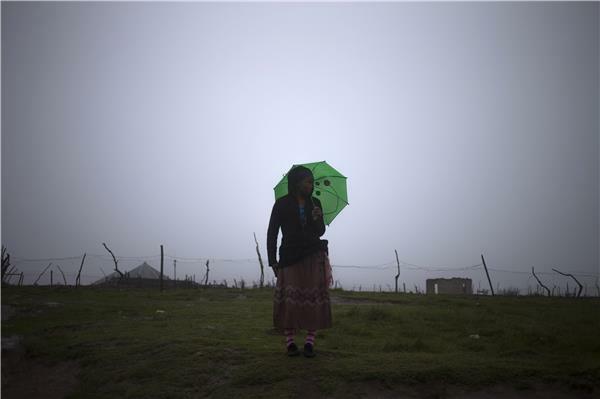 Asked by an Associated Press reporter about a murder charge, Jantjie turned and walked away without commenting. 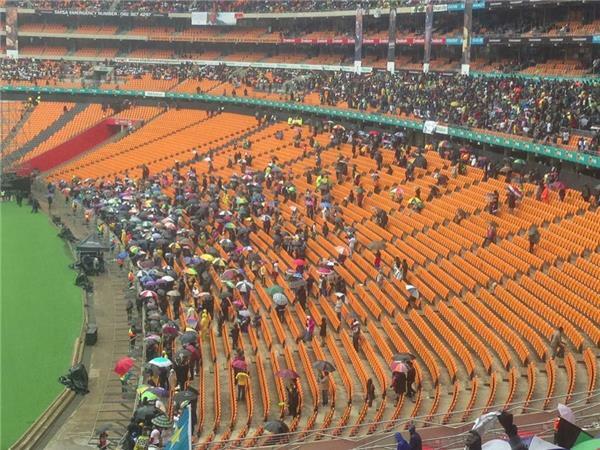 The hundreds of South Africans that pushed their way past a police cordon ran toward the amphitheatre at Union Buildings - the seat of government - where Mandela has been lying in state since Wednesday. 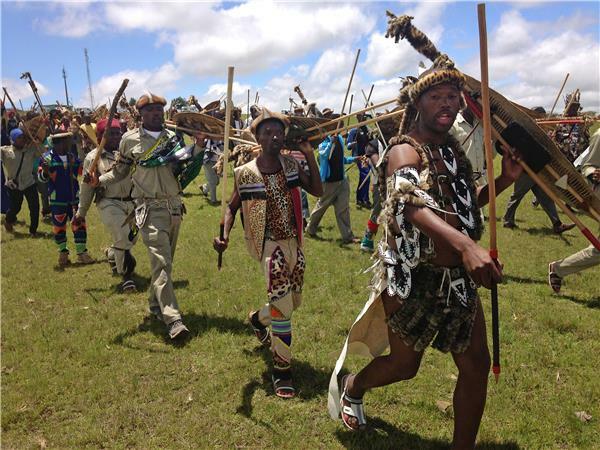 Friday was the last opportunity to view the body, before it is transported to his boyhood village of Qunu for burial on Sunday. Because of the sheer volume of mourners, many of those who queued for hours and in some cases days were left disappointed. 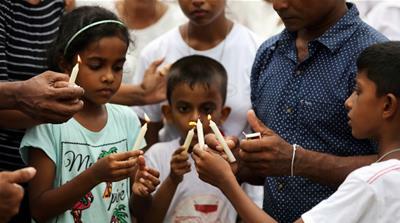 Barely two hours after the public was allowed in to view the open-top casket on Friday morning, the government said it would be unable to accommodate the huge numbers still waiting and appealed for people to stay away. 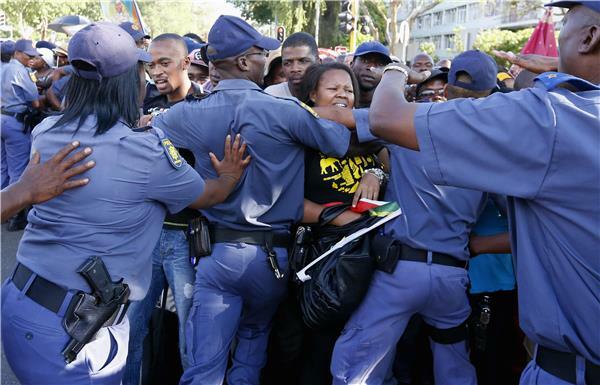 Police officers gave up trying to restrain one group, ordering them in vain to get in line. 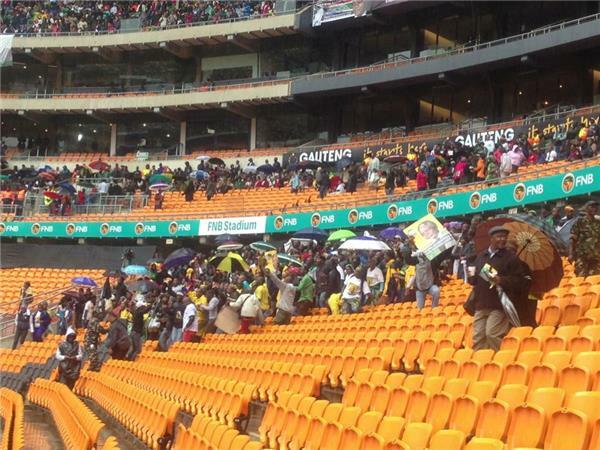 "Police said we should make a queue, but they didn't. 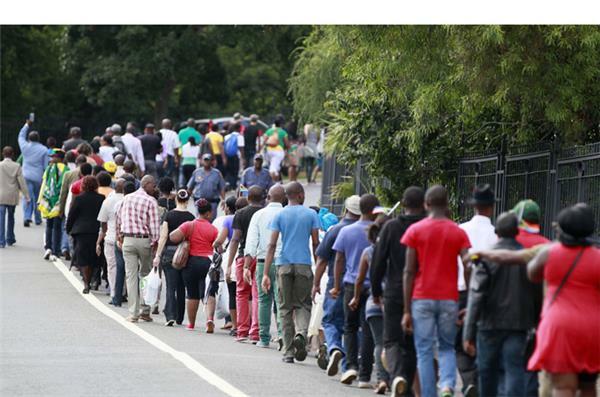 They then started to push," said 27-year-old Gilbert Setshedi, who queued from 7:00am. 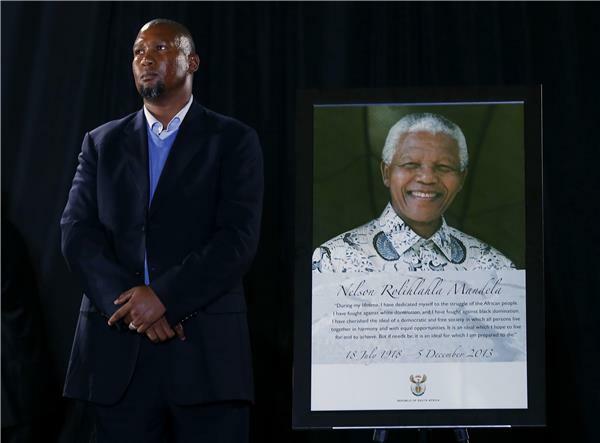 Mandla Mandela, Nelson Mandela's grandson talking about Madiba's legacy during the ANC's final tribute ceremony: "It is through Mande that the world would lend the spirit of endurance, and the triumph of forgiveness and the beauty of reconciliation. 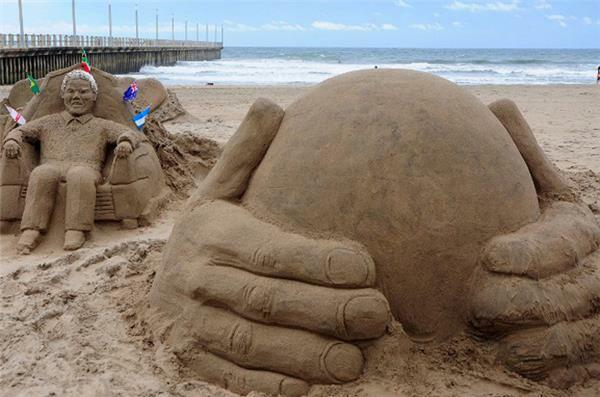 Indeed the story of Nelson Mandela is the story of South Africa." Mandla Mandela talked about his grandfather's tireless political and humanitarian work, and said the future of South Africa looks bright. 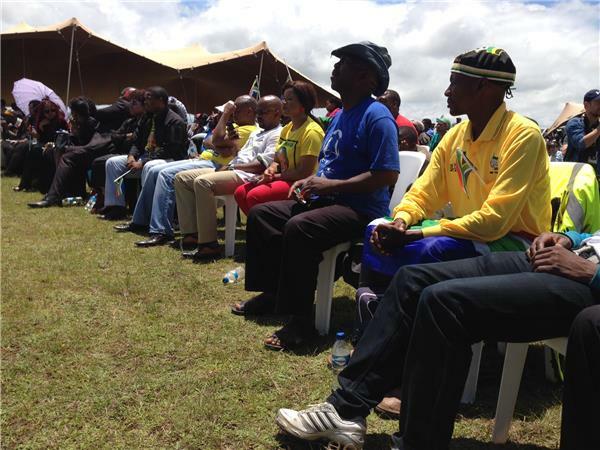 "He was instrumental in the formation of the ANC youth league, which was determined to change the face of politics." 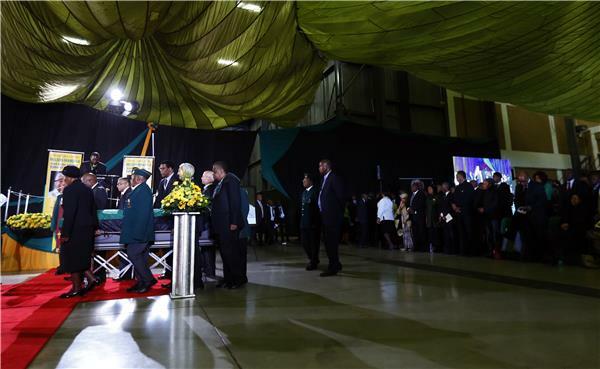 South African President Jacob Zuma says, "Madiba was a leader of a special type," in remarks at the ANC's final farewell ceremony for Mandela. 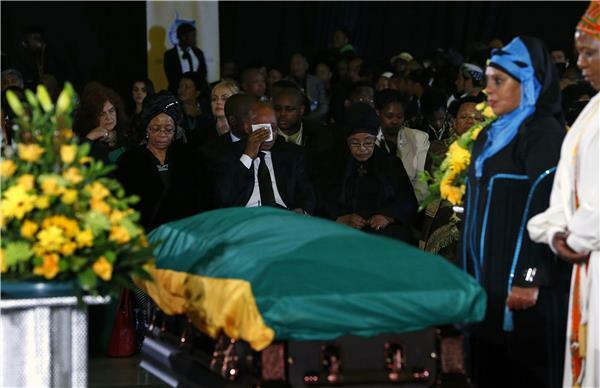 Zuma and Nelson Mandela's ex-wife Winnie Mandela sit behind Mandela's coffin. 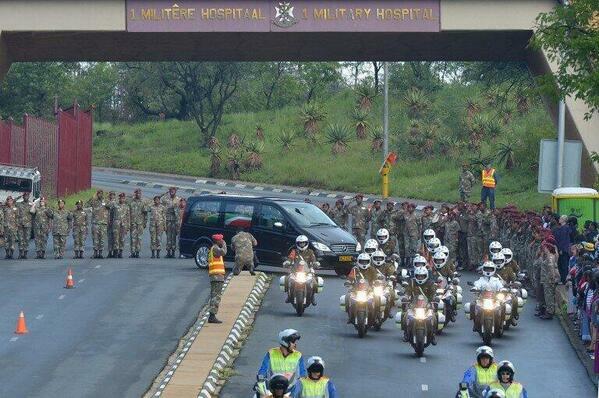 The African National Congress is ending a farewell ceremony for Mandela at Waterkloof Air Base in Pretoria. Zume; "thank you for being everything we wanted and needed in a leader at such difficult times"
"It is the end of an extraordinary journey that began 95 years ago. It is the end of 95 glorious years, of a freedom fighter, a dedicated and humble servant of the people of South Africa. 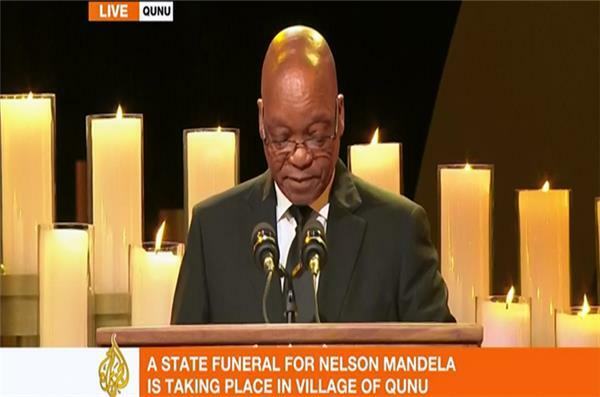 Fountain of wisdom, a pillar of strength, and a beacon of hope for all those fighting for a just and equitable world order," said South African President Jacob Zuma. 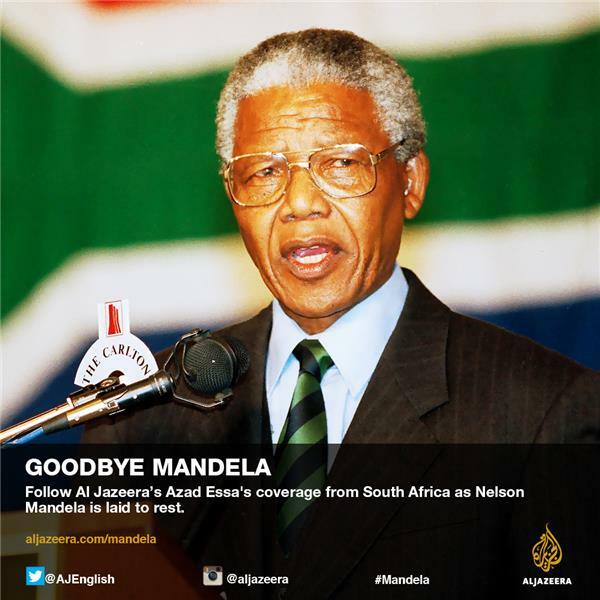 "Your long walk to freedom has ended in a physical sense,'' he said in reference to the title of Mandela's autobiography. "Our own journey continues. 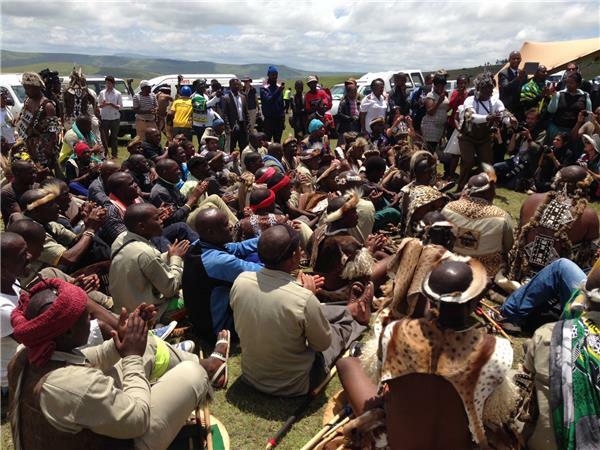 We have to continue working to build the kind of society you worked tirelessly to construct. 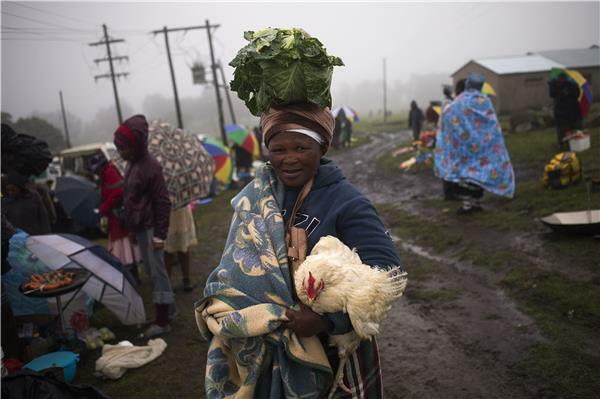 ... South Africa will continue to rise." 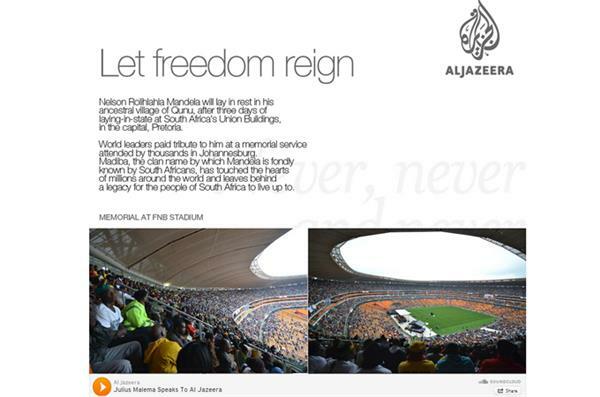 "Your abundant reserves of love, simplicity, honesty, service, humility, care, courage, foresight, patience, tolerance, equality, justice continually serve as a source of enormous strength to many millions of people in South Africa and the world," said Ahmed Kathrada, who was imprisoned on Robben Island with Mandela for years. "Today mingled with our grief is the enormous pride that one of our own has during his lifetime and now in your death united the people of South Africa and the entire world on a scale never before experienced in history." 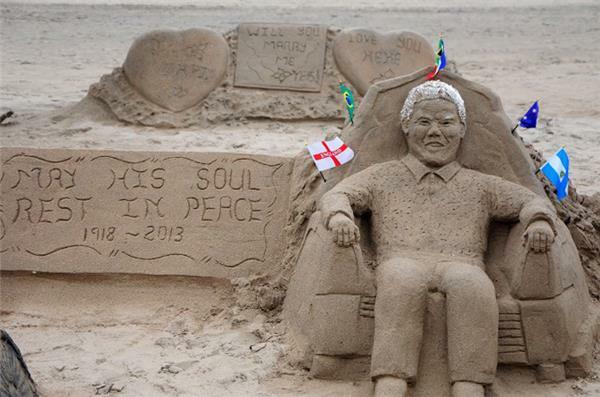 "Go well Madiba . 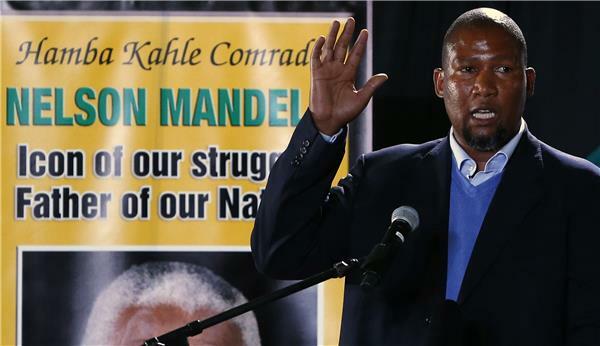 go well to the land of our ancestors, you have ran your race," said Mandela's granddaughter Nandi Mandela using his clan name. "We will carry lessons you taught us throughout our lives ... As South Africans we must stop pointing fingers, but must rather lead by example, as you did." 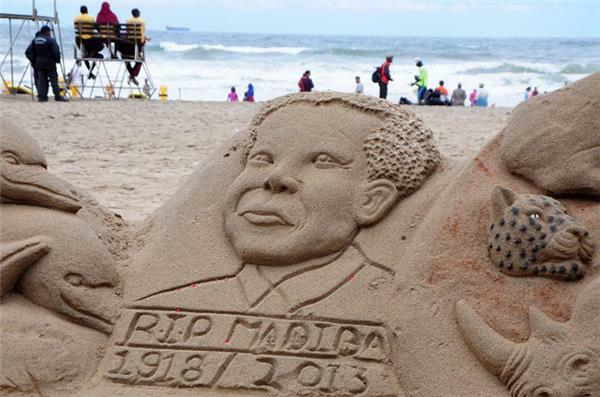 "As we celebrate Madiba's life, we also remember important concepts that Madiba taught us: Tolerance and forgiveness," said Cyril Ramaphosa, deputy leader of the country's governing party, the African National Congress. 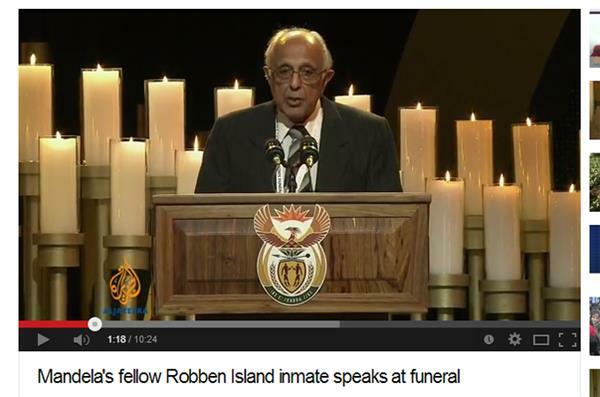 Ahmed Kathrada was imprisoned on Robben Island with Mandela for years. 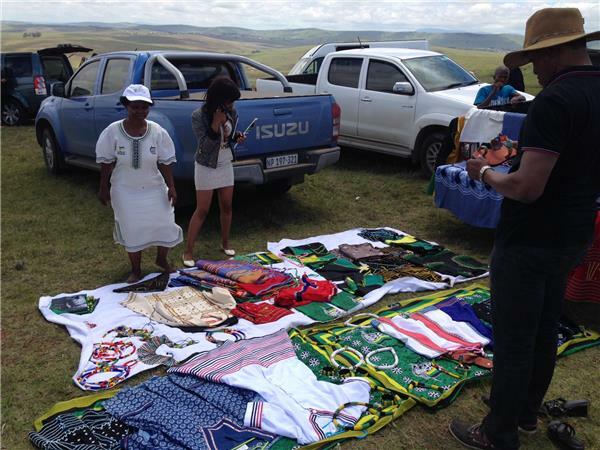 #mandelafuneral very few pple at publi viewing area in qunu. Mainly elderly. Say they "don't feel included. 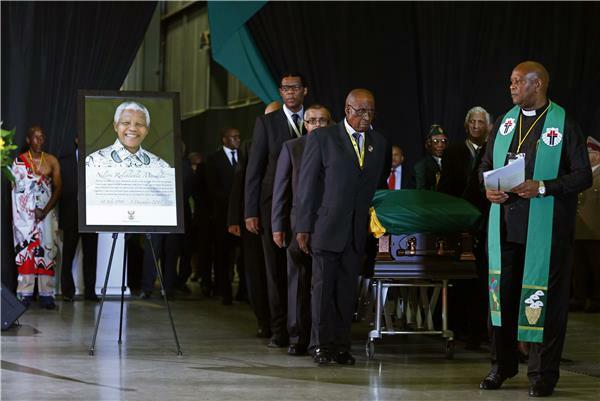 It's like Madiba belongs 2 VIPs"
A 21-gun salute and full military honour guard escorted Mandela's coffin to a marquee where 4,500 mourners said their final goodbyes. His flag-draped casket was placed on cow skins, surrounded by 95 candles - each signifying a year of his extraordinary life. 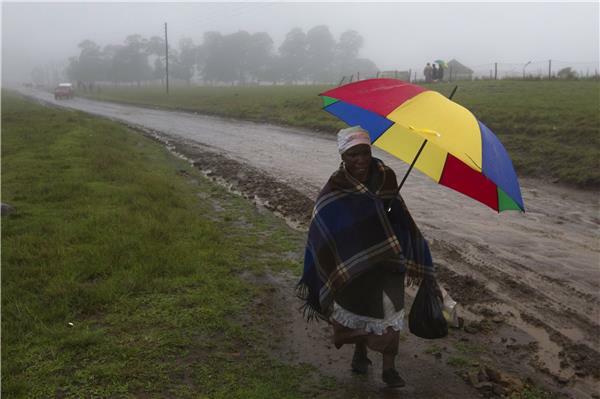 Mandela's body was taken to his family plot for burial after a public state funeral ceremony on Sunday in his rural boyhood home of Qunu. 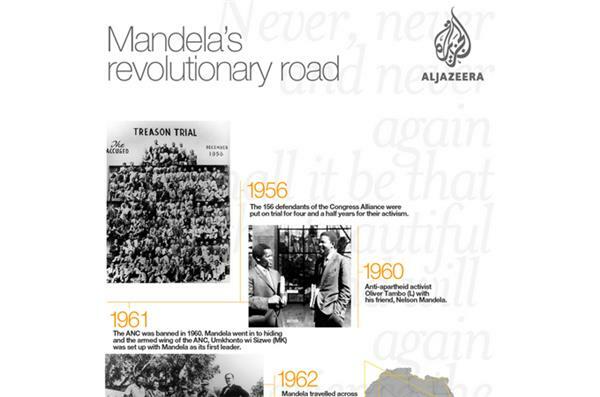 Joyce Banda praised the life of anti-apartheid fighter, "his courage, determination, love and passion for his people." 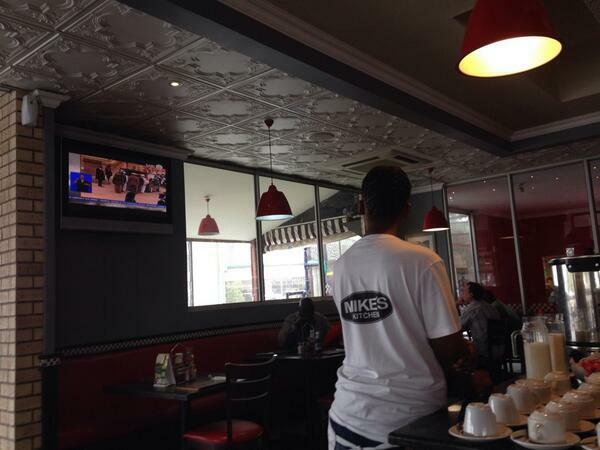 #MandelaBurial "Now you have reached the ultimate freedom in the bosom of your maker"